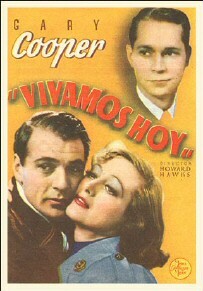 US release: 3/3/33 (premiere); 4/14/33 (general). VHS release: 11/10/93. 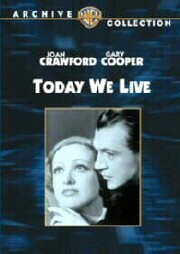 Warner Archive DVD release: 5/2009. 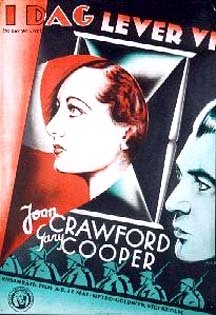 Cast: Joan Crawford (as "Diana Boyce-Smith"), Gary Cooper, Robert Young, Franchot Tone, Roscoe Karns, Louise Closser Hale, Rollo Lloyd, Hilda Vaughn. Credits: From the story "Turn About" by William Faulkner (who also did additonal dialogue for the film). Screenplay: Edith Fitzgerald, Dwight Taylor. 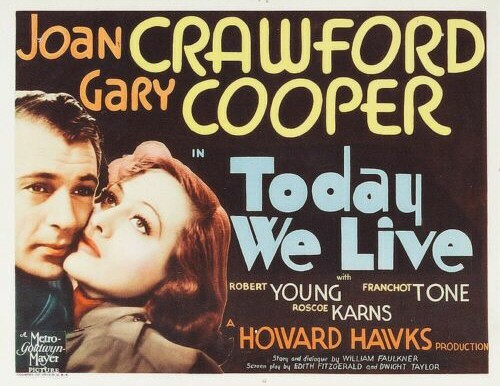 Director: Howard Hawks. Camera: Oliver T. Marsh. Editor: Edward Curtiss. Art Direction: Cedric Gibbons. Gowns: Adrian. Sound: Douglas Shearer. • In production beginning 12/32. • Aerial sequences shot at March Field in Riverside, CA. • Other dogfight footage taken from director Hawks' 1930 film Hell's Angels. 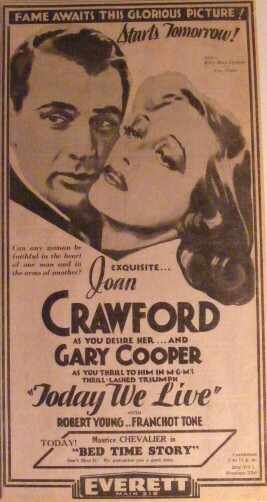 Joan Crawford and Gary Cooper in the First Picture Derived From a Story by William Faulkner. 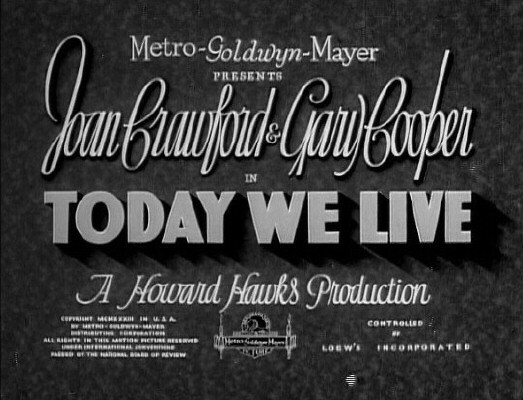 Bearing the title of "Today We Live," there is now at the Capitol the first of William Faulkner's literary efforts to reach the screen. It is said to have been derived chiefly from a short story called "Turn About," which is understood to have been amplified in the studio by the author. Although it is more than slightly different from the general run of cinematic works, it is at times vague and cumbersome. 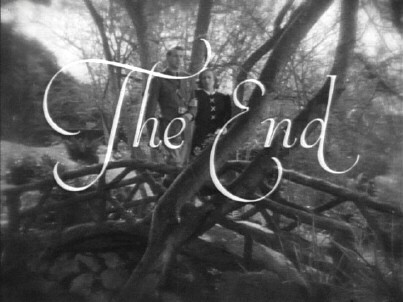 It possesses, however, the spark of sincerity, and its lack of clarity might be ascribed either to Howard Hawks's direction or to the script contributed by Edith Fitzgerald and Dwight Taylor, for there are sequences that are far too lengthy and others that would be considerably improved by more detail. As a drama of the war it is not precisely convincing, for coincidences play an important part in its arrangement. It is also anachronistic, particularly as regard the costumes worn by Joan Crawford. The narrative begins in London, but most of the action occurs in and around Boulogne. 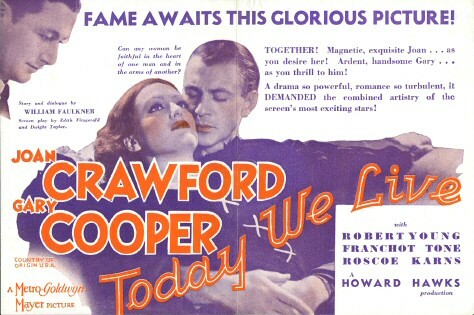 Diana Boyce-Smith, an English girl, played by Miss Crawford, is in love with Claude Hope, but after she encounters an American named Richard Bogard her affections sway to him. Subsequently she hears that Bogard has met death as an aviator and she continues her affair with Hope without benefit of clergy. Her brother, Ronnie, is always in her confidence, but he sympathizes with Hope, for he and Hope are both officers in the British Navy and on the same craft. Judging by what happens during one prolonged episode, Bogard, who is another of those fliers who is thought dead but eventually is found alive, scoffs at sea warfare as it is carried on by Ronnie and Hope, and he gives the latter a taste of fighting in the clouds. They return safely and Ronnie in turn dares Bogard to come out in his motor launch, which is equipped with a single torpedo. Bogard thus learns that there is as much excitement on the water as in the air, and, in the course of the daring attack on enemy vessels, Hope is blinded by a missile. The rivalry between the aviator and the naval officer persists to the end—when, after hearing that Bogard has volunteered to sacrifice his life to sink an enemy ship, Ronnie and the sightless Claude Hope speed out in their craft and succeed in accomplishing the desired task at the cost of their lives, before Bogard has a chance to swoop down from the air. So there are three heroes in this story. The romance between Bogard and Diana is set forth so abruptly that it is apt to seem absurd. The constant meeting of the four characters in France scarcely adds to the credibility of the story, and the activities supposed to be in the North Sea give the impression that German vessels were either hovering around or anchored somewhere in the vicinity of Boulogne. The producers could not possibly mean that the attacks were on Zeebrugge, for there is nothing that bears a semblance of the famous mole. 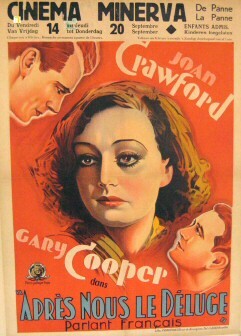 Miss Crawford, although she never impresses one as being English, gives a steadfast and earnest portrayal. Robert Young is excellent as Hope, and Franchot Tone does well as Ronnie. Gary Cooper is quite believable as Bogard. 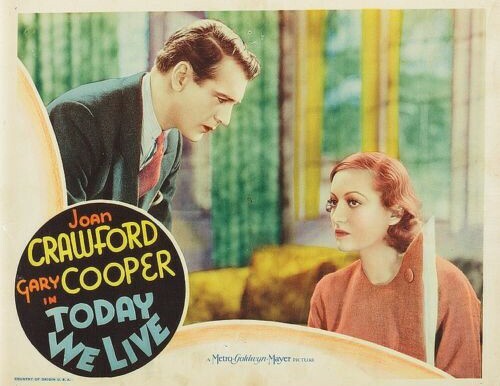 Visually, Today We Live is handsome, striking and genuinely dramatic, and that is not merely because Miss Crawford is photographed so beautifully. 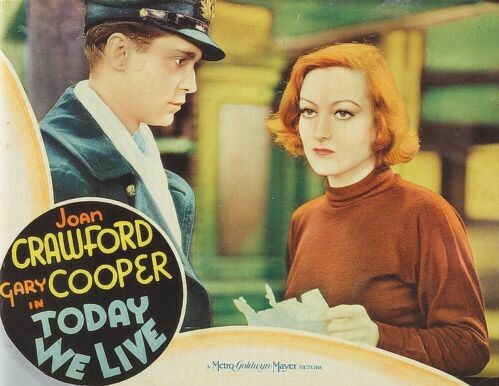 The scenes of aerial warfare are enormously effective, but such scenes have been portrayed so frequently that they have become the commonplace of the photoplay....Miss Crawford is properly effective in her role even if she doesn't seem like someone called Boyce-Smith. Although William Faulkner is billed as the author of Today We Live, the picture is no devastating survey of the degeneracy of the New South, filled with murderous neurotics and pathological passions. Instead, it is a lugubrious romance of the war, replete with clipped speeches, heroic sacrifices, self-effacing nobility and many cries of "stout fellow!" 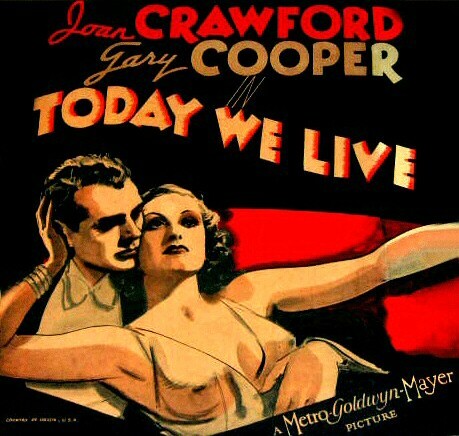 As a matter of fact, it is only when one of the characters begins to play quaintly with a cockroach that you see any particular traces of the Faulkner influence at all....[The film] devotes most of its efforts to permitting Robert Young and Franchot Tone to destroy themselves gallantly so that Gary Cooper may henceforth live happily with Miss Joan Crawford. It was my suspicion yesterday that their sacrifice was too great. If you've seen Today We Live and would like to share your review here, please e-mail me. Include, if you like, a picture of yourself to accompany your review, as well as a star-rating (with 5 stars the best) and any of your favorite lines from the film. This movie is so bad and has so little interest that even a rainy day won’t make it interesting or appealing. There is no mood I can find for this movie. I can find or be in a mood for Trog way before Today We Live comes off my shelf. Maybe I can find something, but I doubt it. Not even my beloved character actors Roscoe Karnes and Louise Closser Hale can save the film for me. William Faulkner, one of my favorite American writers, should have stayed home where he liked to be…His father died during the writing, and he kept up on all the changes in the script despite his family troubles. Still no one was satisfied with the script. 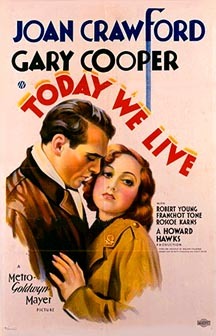 Howard Hawks (a really nice man) created a semi-30’s take on WWI England; it just doesn’t work for the type of “guy"-film this was supposed to be. He survived Harry Cohn, Daryl Zanuck, the Warner Bros., and Howard Hughes. He had to survive MGM: The money was too good for those years, but he got stuck on this one. 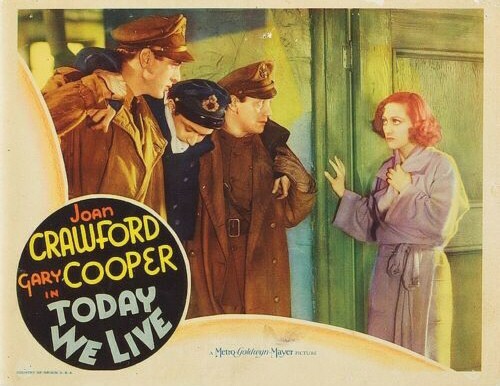 Today We Live ranks down among my least favorite of all Joan films. (Trog, Goodbye My Fancy, This Modern Age, and Esther Costello share the dubious distinction.) 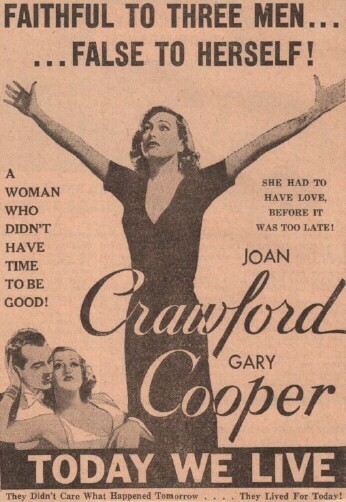 Despite direction by Howard Hawks, story and dialogue by William Faulkner, and Gary Cooper for a co-star, the film's a boring and implausible mess (and was Joan's only box-office flop for MGM up until The Ice Follies of 1939). 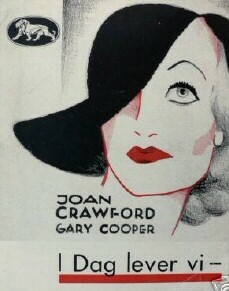 After Joan completed Rain in '32, MGM had no project immediately lined up for her. Not wanting to waste the salary they were paying, the powers-that-be ordered director Hawks to insert a part for her in what was to have been an all-male WWI fighter-pilot melodrama called Turnabout. In this new incarnation of the intended film, Joan plays "Diana Boyce-Smith" (aka "Ann"), a young, rich Englishwoman in World War I Britain whose father has just been killed in action. 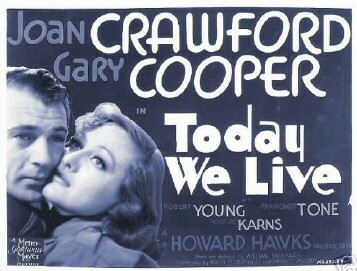 Gary Cooper is "Richard," an American who has come to buy her estate. In their first scene together, Richard walks around touching Ann's father's things; she is depressed and irritated and he leaves, contrite. In their very next scene together, however, Richard and Ann are suddenly declaring their love for each other. Huh?? There is absolutely no build-up to this newfound passion, which is just the first in a very long line of "Huh?" 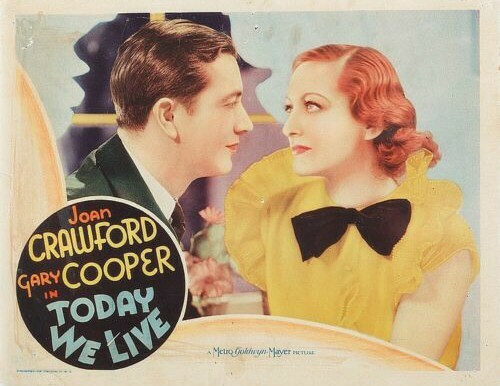 moments that include Ann's wardrobe in the opening scenes: The film takes place in the decidedly pre-flapper year of 1916, when women still wore their long hair in buns and their hemlines just inches above their ankles. 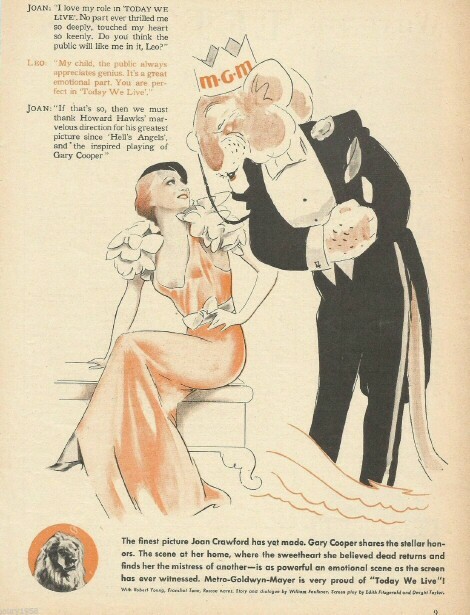 Yet here's Joan, with a chin-length Garbo-esque do and a wildly deco Adrian creation, accompanied by high heels and a skirt barely covering her knees. (Soon afterward she appears in an equally unlikely suit with padded shoulders and various geometric pins affixed.) Also adding to the film's lack of credibility from the get-go is the failure of the leads to even attempt a British accent. (I take that back: Robert Young noticeably tries...once.) Walking around saying "Cheer-o" and "Stout fellow!" doesn't quite do the trick. There's also the oddity of Franchot Tone's character clenching his pipe in his mouth upside down on several occasions. An in-joke, or another case of no one paying aesthetic attention? There's definitely the sense that no one is minding the store here. The plot is also extremely weak and poorly written. (I hope literary giant Faulkner was duly ashamed of himself.) 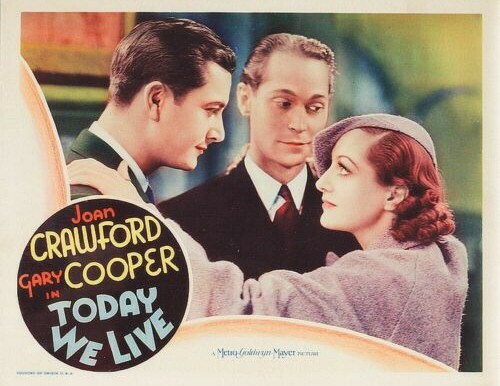 Aside from Ann and Richard, the other two leads are Ann's brother Ronnie (Franchot Tone), a completely superfluous character, and Ann and Ronnie's childhood friend, Claude (Robert Young). 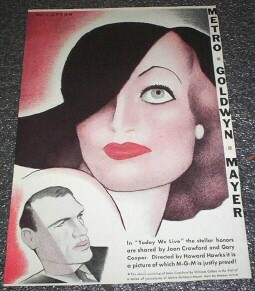 (Side-note: This was Tone's second film for MGM. 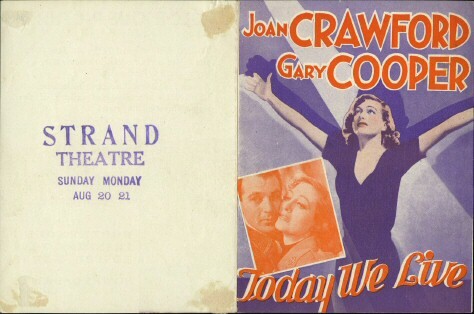 He and Joan met for the first time on this set and were married in 1935.) Before Ronnie and Claude ship off for war (or, in this case, London), Claude asks Ann to marry him. Out of fondness and sentimentality, she says yes... But she loves Richard! Will she choose American Richard or chum Claude?! The trite characters and dull, often nonsensical writing make this, for me, a runt of the Joan litter of films. Though Joan herself is gorgeous here, and gorgeously shot (by the expert Oliver T. Marsh who, along with George Folsey, was her primary cameraman at MGM), her looks and lighting aren't enough to rescue a poorly conceived and even more poorly executed film.